St. James’s Church, Castledermot, is situated on the site of monastery founded around the year 800 by the father of St. Diarmuid and is an active church in West Glendalough Diocese of Dublin and Glendalough, Church of Ireland. 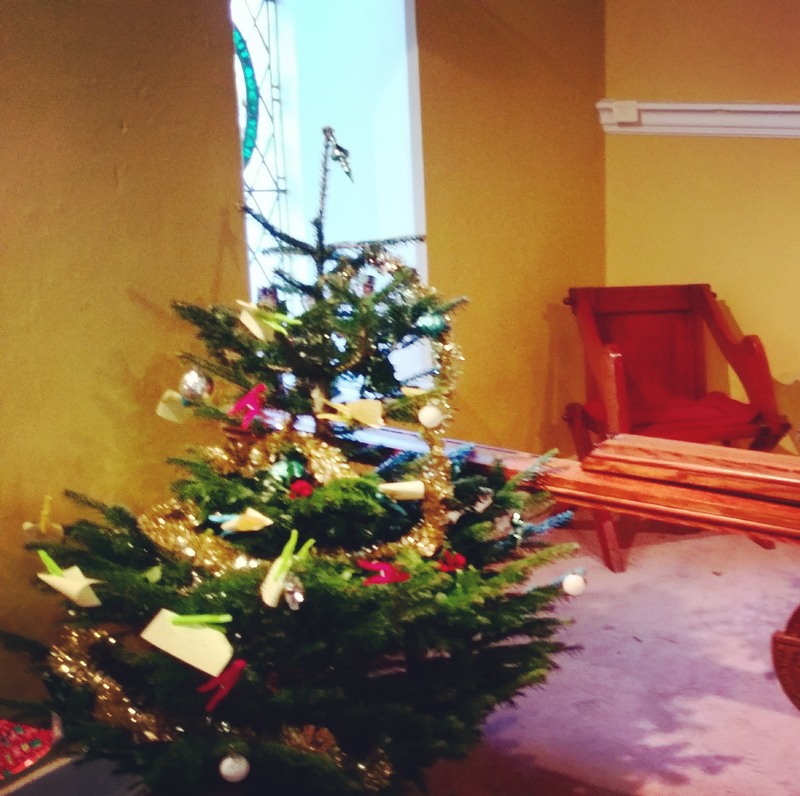 Dean Philip Knowles, Priest in Charge encouraged the parishioners of the group of parishes of Narraghmore, Timolin, Castledermot and Kinneagh to hold a Christmas Tree Festival in St. James’s Church. Parishioners were encouraged to seek support from local organisations to erect and decorate Christmas Trees for the festival. The festival was officially opened by Martin Heydon TD. The church was transformed into an oasis of relaxed calm and colour and thirty trees were placed in windows, pews, corners and the sanctuary. As part of the commitment of the parish to the Church’s Ministry of Healing, the Healer Prayer Group of the parish agreed to participate in the festival by erecting a “Tree for Healing”. A simple four foot high fresh Christmas tree was provided and situated in front of the church altar which housed the most beautiful Christmas Crib. The figures of the crib were colourful pottery and made by a parishioner who attends a class which added to the whole scene of peace and expectation. Everyone who attended the festival was invited to write their prayer request for healing on a colourful slip of paper, which was pegged to the tree. This space was peaceful, prayerful and most colourful and was especially pleasing to the children. Parents encouraged their children to write a prayer to God for a family member who was ill—children responded very positively, in fact most people participated and helped to decorate the tree with their prayer request. Whereas the main objective of the event was to provide funds for the rebuilding of the wall around the church, it must be acknowledged that the Healing Tree provided an opportunity for prayer and spiritual reflection, for a deepening relationship with God, forgiveness and grace and thanks for healing. Two thirds of the prayer requests were for healing. Other requests were for the homeless, for God’s creation, world peace, mental health difficulties, those suffering from dementia, those providing suicide initiatives. On Sunday 28th January all the requests for prayer were placed on the altar for the service of Holy Communion and the prayers were prayed together. The experience excelled all expectations for me both spiritually and prayerfully and for all who participated and attended the event. Parishioners provided refreshments in the parish hall and Christmas handcrafts were for sale. The organisers were greatly appreciative of the peoples’ generosity.